Somebody on Last.fm was nice enough to upload this rare gem for me (I hope it's alright with them that I'm sharing this, but this was only limited to 500 copies, why not?). 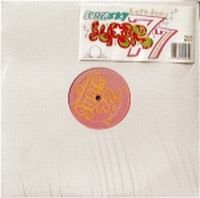 The first track, 'Super 77,' is intriguing in it's concept, it's a composition composed entirely of the sounds of the band's manager's then-three-month-old son, however, it falls pretty flat in holding that much attention. This track can easily be skipped. The second track, 'Super Sky,' is a great listen and is what one would expect with later Boredoms. Tranced-out sounds and tons of drums. What is odd is that 'Super Sky' is supposed to be an early version of 'Super Going,' and while there are many recognizable moments, the song actually starts with the end of another song, 'GO!!!! !,' the single 64 minute track off of their release, Super Roots 5. Mmmmm. Not often do you get to hear a Boredoms track before it's heavily manipulated in post-production, so it's an intriguing listen either way. Usually most Boredoms is good Boredoms (everything before Seadrum anyways... OOPS! LOL), this is no exception. Check it out! Great clarion call for your nonconformist way of life. Pretty shite to actually listen to though. Seadrum is AMAZING!!! One of the best ones!